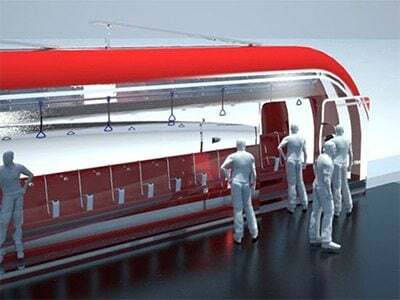 Now a days rail transport become a cheap means of transport to any class of people and for the working of the trains it requires some energy in the form of Electrical finally to convert in to mechanical support for the propulsion. For that among the various forms of energy solar energy is the best form to use in the present situation. Here the solar energy is converted in to the electrical energy by using solar panels and then used for the needs. Revolutionary changes have taken place in the life of the mankind since human beings acquired the capability of walking upright. Ultimately the man has succeeded to achieve his needs to be done faster through Maglev. 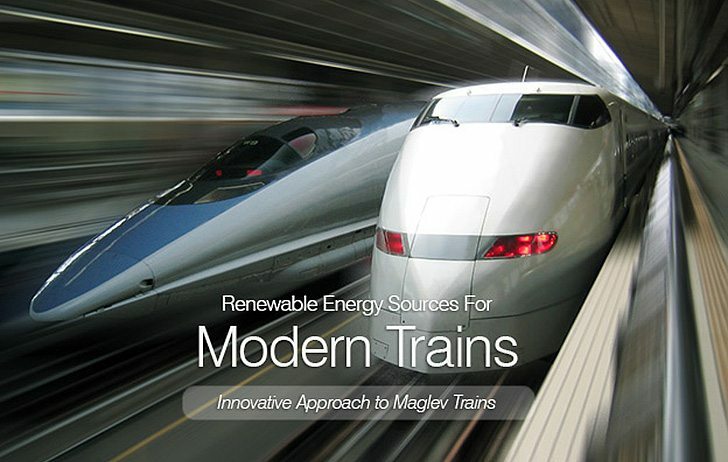 Electrical energy plays a key role for the Maglev. 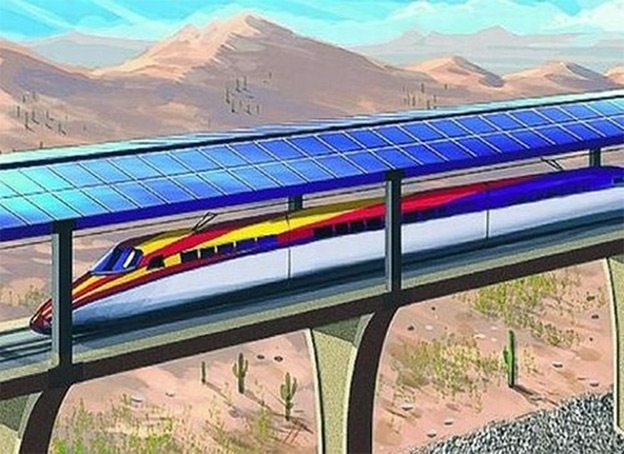 For that the solar energy is used for the electricity generation for the modern train i.e.., Maglev train to work efficient and effective such that the electrical consumption can be decreased. Speed is a target the mankind is eternally seeking. One of the characteristics of the society created by modern science and technology is the large volume of information and the wide high speed transmission of information. With such an aspiration of the mankind’s for high speed transportation, Maglev technology was born at the right moment. In olden days while the man was in search of the fast transmission of information railways make a way to them. Rail transport is where a train runs along a set of two parallel steel rails, known as a railway or railroad. The rails are anchored perpendicular to ties (or sleepers) of timber, concrete or steel, to maintain a consistent distance apart, or gauge. The rails and perpendicular beams are placed on a foundation made of concrete or compressed earth and gravel in a bed of ballast. Alternative methods include monorail and maglev. A train consists of one or more connected vehicles that run on the rails. Propulsion is commonly provided by a locomotive that hauls a series of unpowered cars that can carry passengers or freight. The locomotive can be powered by steam, diesel or by electricity supplied by trackside systems. The term “maglev” refers not only to the vehicles, but to the railway system as well, specifically designed for magnetic levitation and propulsion. All operational implementations of maglev technology have had minimal overlap with wheeled train technology and have not been compatible with conventional rail tracks. Levitation is the process by which an object is suspended by a physical force against gravity, in a stable position without solid physical contact. Controllable electromagnetic field is generated by exciting on-board levitation magnets and the magnets and stator packs of long stator linear motor along the guideway attract each other thus pulling the train upward and a stable levitation gap being guaranteed by controlling the levitation excitation current. 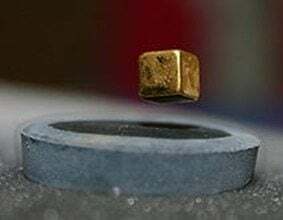 Levitation gap between magnets and guideway is normally controlled to the range between 8 and 12 mm. Electromagnetic using electricity to create a magnetic field and Propulsion- the process of propelling something. The guideway guides the direction of the train’s movement and bears the load of the train. The superstructure of the guideway comprises precisely welded steel or reinforced concrete guide way beams for connecting long stators and substructure constituted by the reinforced concrete piers and foundations. Vehicle is the most important part of high speed maglev system comprising levitation chassis and the magnets mounted on the chassis, secondary suspension system and vehicle section. Besides it includes such electrical appliances as on-board batteries, emergency breaking system and levitation control system. Power supply includes: substations, track side feeder cables switch stations and other power supply equipment. Power supply system feeds the train with the power required for the train operation by energizing the long stator windings on the guideway. First, high voltage alternating current is taken from the 110kv public power grid, step-down to 20kv and 1.5kv using step-down transformer and then converted in to direct current via rectifier, then converted back to variable frequency ac current between 0 and 300Hz via rectifier. After step-up, the current will be fed to long stator winding on the guideway via guideway cables and switch stations, generating propulsion force between the stator and on-board magnets. The rectification equipment and motor stators etc… of the Maglev system are all installed on the ground. No strict requirements for the volume, weight and anti-vibration of the equipment are available. It is the fundamental guarantee for the normal operation of the entire Maglev system. It includes all the equipments to be used in security guarantee control, execution and plan and also includes the equipment to be used in communication among the equipment. Operation control system consists of: operational control center, communication system, decentralized controlled system and on-board control system. For electromagnetic suspension (EMS), electromagnets in the train attract it to a magnetically conductive (usually steel) track. Electrodynamic suspension (EDS) uses electromagnets on both track and train to push the train away from the rail. In current electromagnetic suspension (EMS) systems, the train levitates above a steel rail while electromagnets, attached to the train, are oriented toward the rail from below. The system is typically arranged on a series of C-shaped arms, with the upper portion of the arm attached to the vehicle, and the lower inside edge containing the magnets. The rail is situated between the upper and lower edges. The major advantage to suspended maglev systems is that they work at all speeds, unlike electrodynamic systems which only work at a minimum speed of about 30 km/h. This eliminates the need for a separate low-speed suspension system, and can simplify the track layout as a result. On the downside, the dynamic instability of the system demands high tolerances of the track, which can offset, or eliminate this advantage. In electrodynamic suspension (EDS), both the rail and the train exert a magnetic field, and the train is levitated by the repulsive force between these magnetic fields. The magnetic field in the train is produced by either electromagnets or by an array of permanent magnets. The repulsive force in the track is created by an induced magnetic field in wires or other conducting strips in the track. A major advantage of the repulsive Maglev systems is that they are naturally stable – minor narrowing in distance between the track and the magnets creates strong forces to repel the magnets back to their original position, while a slight increase in distance greatly reduces the force and again returns the vehicle to the right separation. No feedback control is needed. An EDS system can provide both levitation and propulsion using an onboard linear motor. EMS systems can only levitate the train using the magnets onboard, not propel it forward. As such, vehicles need some other technology for propulsion. A linear motor (propulsion coils) mounted in the track is one solution. Over long distances where the cost of propulsion coils could be prohibitive, a propeller or jet engine could be used. 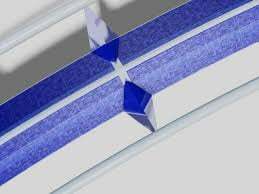 If superconducting magnets are used on a train above a track made out of a permanent magnet, then the train would be locked in to its lateral position on the track. It can move linearly along the track, but not off the track. This is due to the Meissner Effect. Energy for maglev trains is used to accelerate the train, and may be regained when the train slows down .It is also used to make the train levitate and to stabilise the movement of the train. The main part of the energy is needed to force the train through the air. Also some energy is used for air conditioning, heating, lighting and other miscellaneous systems. The Solar power pulley system Maglev train is a small scale replica of two ingenious inventions: combined-solar panels and the maglev train with a few modifications. In the Maglev trains, while there was movement, the track is covered with a closed roof such that the roof of top part covered with solar plates where they absorb the sunlight and acts as source to the track such that they were in the superconducting state to levitate the train when there is the movement. While in the other method of using the solar energy is to use the solar panels on upper part of the train such that the energy is conserved and used irrespective of the motion of the train. In real life if these two inventions to be combined then it would be one of the best inventions ever. It would be a clean and renewable method of transportation. It would be environmentally friendly as zero green house gases would be produced which is important since climate change is a big issue these days. Maglev rails are those in which the rail acts as the solar panels and they conserve the energy as well as they act as the track for the maglev train. Ultimately the maglev technology is safe, economic and advanced. Someone said: “Maglev train is the most fundamental breakthrough in the railway technology since the advent of Stephenson’s “Rocket” steam locomotive about 200 years”. This is not at all too much praise. Maglev train should be regarded not merely as a fundamental breakthrough, but much more as an example of modern transport means. The use of the solar energy made us to not to find for the alternative source for the electric supply to the track and to the train and even it may not provide total requirement of power to the train it decreases the respective input that to be supplied to the train and track. If at all possible, I would like to connect with the author Vinod Ramireddy. I may have an opportunity to build this system. I think the idea of using solar panels on the trains roof is quit innovative and can be implemented on conventional indian trains, it would be beneficial to indian railways. You may like the two films on http://www.quantumtrain.com. Dear proud to u. keep it up. This is a very informative article delivered very precisely.Yes searching net is an option but consolidation is very important.All consolidated very well. Your technical article more then great. Very informative and yet concise.